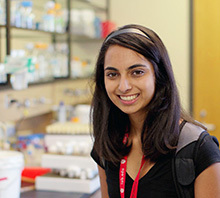 The College is committed to helping you actively pursue your interests through research. Add power to your degree and gain valuable skills that impress employers (and graduate schools, too). Once you’ve conducted your research, share your findings in the IU Journal of Undergraduate Research, a 100% student-run, faculty-mentored research publication exclusively for undergraduates. Research experiences teach you to consider how the materials in textbooks are discovered. They teach you the value of skepticism and the importance of asking questions. Learning how to analyze situations rigorously is a skill that has helped me tremendously both in and out of the classroom.